We are excited to announce a major update to the Common Data Service for Apps. The new update includes several new features including server-side logic, improved app building experiences and developer capabilities. Here is the announcement made for these new functionalities today. To leverage these new functionalities, you need to create a database with the latest version of the Common Data Service. 1. Sign in to the PowerApps Admin center. Make sure you have PowerApps Plan 2 or PowerApps Plan 2 trial. In case you don’t have one, sign-up for a PowerApps Plan 2 Trial. 2. Click on the New environment in the upper right corner, to create a new environment. It will launch a modal dialog, and you can enter the name for the new environment. 3. Select the region you want to create the environment in. The region defaults to the Azure Active Directory Tenant home region. 4. Select the Type of the environment –Production or Trial, depending on the purpose you are creating this environment for. If you want a permanent environment to develop apps and store data for your organization, then you should create a Production environment. If you have a PowerApps Plan 2 license, you can create up to two Production environments. 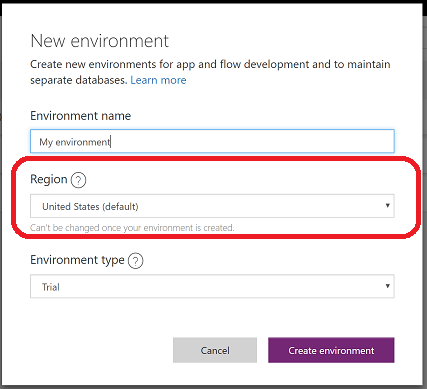 If you are just trying out the Common Data Service, PowerApps, or Microsoft Flow, then you should create a Trial environment. 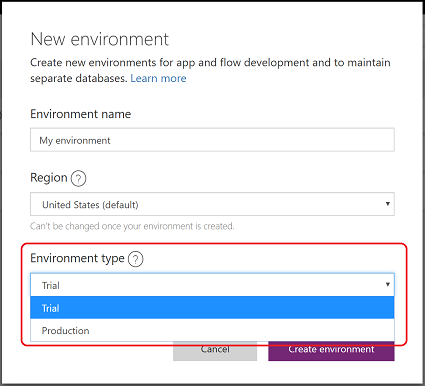 If you have a PowerApps Plan 2 Trial license, you can create up to two Trial environments. Trial environments will expire after 30 days. 5. Once the environment is created, proceed for creating a Database. 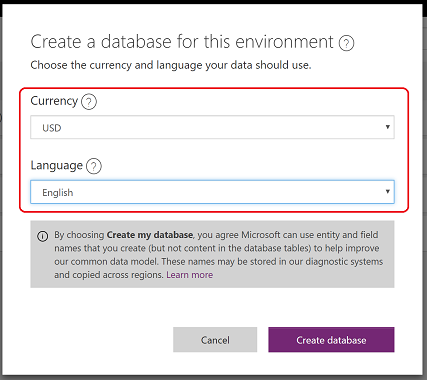 Select the currency and language for the data stored in the database and click on Create database. It might take up to few minutes to provision the database. Learn more on how to manage an environment in admin center. How can I manage the security and permissions for this environment and database? In the new update, you can manage the security for your environment and database with enhanced functionalities like Row Level Security, Field Level Security and more. Learn more on how to leverage these functionalites for your environment. No database is yet provisioned in the environment: Creating a database in these environments, will provision a database with the latest version of the Common Data Service and you can very much leverage the new functionalities available with the update. Database is already provisioned in the environment: If you have already provisioned a database (before today), then the new functionalities will not be available in this environment. You need to create a new environment and database to leverage the new functionalities. Your existing database, will continue to work as is. Watch out for an update from us on how to upgrade an existing database to the latest version of Common Data Service. Leverage other functionalities, which comes with your new database, by reading here.